I’ve seen these ads for SUCH a long time an LOVE them! 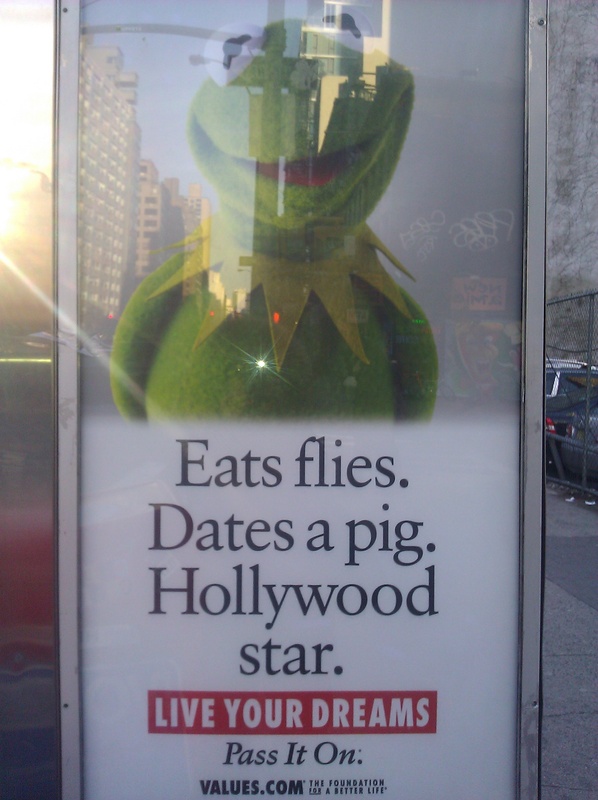 I mean Kermie, it’s TRUE! And YES, I’m well aware that Kermit is a Muppet, but he was someone’s dream too! And now the Muppets are back and bigger than ever, bringing so much joy to children and adults everywhere. Today is YOUR day to live your dream. It starts with an idea, a vision, make today the day you write it, say it out loud, take a step. My dream is to share my story. I want to help people by educating them on the benefits of health. I want to be a leader in the fitness industry, to create change in schools, to make HEALTH (body, mind & spirit) the number one focus for everyone. I want everyone to GETFIERCE! What’s YOUR dream? Share it, here or with someone you love (or even someone you just like). When you say it out loud it makes it powerful, it makes it possible. Let’s start this change together! This entry was posted in FIERCE SOUL by GETFIERCE TRAINING. Bookmark the permalink. That is quite inspiring that you participated in the NYC 1/2 Marathon. I was wondering if you might have any tips for those of us who might be interesting in running a half marathon and if you had any training tips when you reflect upon your own experience at the 1/2 marathon. Were there things you might have done differently when training for the 1/2 marathon – or things you would recommend others to avoid? For instance, sometimes improper running form can develop bad knees in the long run.